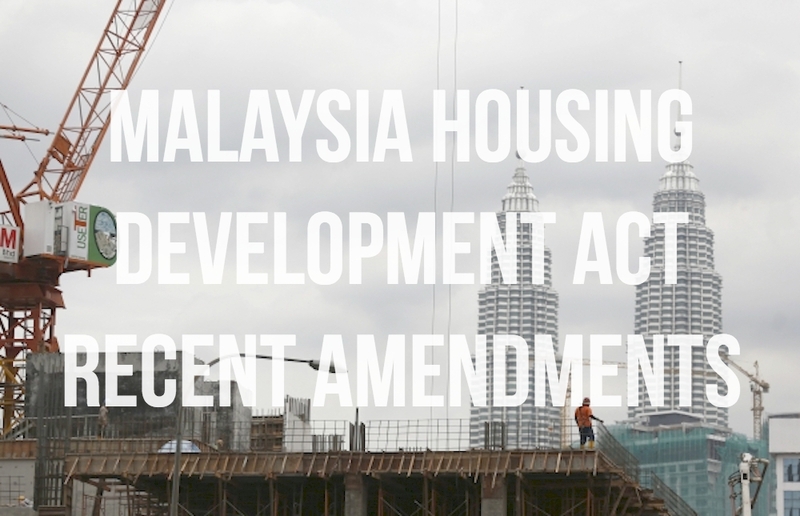 Housing developers in Peninsular Malaysia are mainly governed by the Housing Development (Control & Licensing) Act 1966 and its related regulations and guidelines issued by state authorities from time to time. The HDA 1966 plays a dual role whereby its provisions detail the licensing rules of housing developers and their associated duties and responsibilities which in turn serve to fundamentally protect purchasers of housing accommodation. In order to obtain a developer’s licence, developers are no longer bound by the ‘one-size-fit-all’ deposit amount of RM200,000.00. The revived s.6(1) HDA 1966 provides for developers to make deposit of a sum equivalent to 3% of the estimated cost of the construction of a housing development of their respective projects. This new amount of deposit is hoped to be fairer on small-scale housing developers and also act as an effective mechanism to weed-out ‘weak players’ from entering the industry from an early stage. However for developers who were granted the licence immediately before 1st June 2015 but have not paid any deposit, the old law on payment of deposit will still apply i.e. developer to pay a deposit of not less than RM200,000.00. Under the amended Regulation 4 of Housing Development (Control & Licensing) Regulations 1989, the time limit within which developers must renew their licences has been shorten from 60 days to 14 days before expiry of the same. Developers must also ensure that their licences are kept active (i.e. renewed) until the certificate of completion and compliance is granted for their projects. HDR 2015 also provides substituted versions of the prescribed sale and purchase agreements (or more commonly known as Schedule G and Schedule H). Therefore, housing developers who will obtain their licences and advertising permits on/after 1st July 2015, must duly adopt the amended Schedule G and Schedule H.
In the event the redemption sum is greater than the said installments (in Third Schedule), the redemption sum shall be fully settled by the Developer to its financier with the consent of the Purchaser of monies in excess of 50% of the purchase price. Purchaser must obtain facility within 30 days after receipt of stamped sale and purchase agreement. If the facility is not approved, Developer must refund the balance of amount payable to Purchaser within 30 days. Purchasers have 30 days to settle progressive payments to developers as stipulated in the Third Schedule. Interest on late payment cannot be charged for a period of 6 months on purchasers who obtained financial facility from Government. Developer shall apply for subdivision of title and execute memorandum of transfer in favour of the purchaser before delivery of vacant possession. In the event of late delivery of vacant possession and failure of developer to pay liquidated damages for such late delivery, purchaser shall be entitled to deduct the said damages from any installment of the purchase price due to developer. Developer must let the Purchaser into possession of the property upon the issuance of separate strata title and the completion of any alteration or additional work. Purchasers shall be deemed to have taken vacant possession upon the expiry of the 30 days from the date of notice of delivery of vacant possession. Developer may apply to the Controller of Housing for a certification in writing to deliver vacant possession if the separate strata title to the parcel is not issued for any reason not attributable to the Developer. Developer shall name its stakeholder solicitor upon signing of the SPA. The developer is entitled to replace the named solicitor before stakeholder sum for the defect liability period has been paid to the named solicitor and prior written notice is given to purchaser/purchaser’s financier. The developer shall bear the cost incurred in the application for obtaining the consent of the state authority to transfer the parcel to purchasers. Purchaser has obtained a written consent from financier. Expansion of this definition is surely welcomed in providing security to bridging financiers, purchasers and other stakeholders in the building industry, especially in light of the escalating phenomena of abandoned housing projects. A developer convicted under the new s.18A shall face punitive punishment of fine between the range of RM250,000and RM500,000 or imprisonment for a term not exceeding 3 years or both. Viewed in totality, it is undeniable that the recent amendments on HDA 1966 are strict against developers. This is crucial in view of the fact that majority of buyers of houses in Malaysia are first time purchasers who utilise their lifetime savings to secure a home for themselves. Such purchasers are usually not aware of or do not understand the procedures and intricacies involved in a typical sale and purchase transaction; most often than not, they do not have an equal bargaining power against housing developers who are normally ‘repeat-players’ in the field of housing development. As such, it is only the law that can be the protective shield for purchasers against potential risks involved in purchasing a property, especially those under construction, from housing developers.